Nationwide dwelling prices are falling! The RBA and APRA will be well pleased with how this ‘managed pause’ in the property market is playing out. With doom and gloom on every channel, especially around the coming course of the property market, the analysts at Macquarie are doing what they could – hand around the chamomile tea. Despite almost daily negative headlines in the mainstream media, the rate of adjustment has also been relatively orderly. Nationwide dwelling prices are currently falling at a 2.5-3% annualised rate, and Sydney housing prices have been falling for four quarters at a broadly stable 4% annualised pace. I thought this chart they show was interesting. What it shows is that property falls are entirely due to the top end of town. In the cheaper 75% of the market, prices are still rising. It’s only in the top 25% where prices are falling. Of course, what’s ‘average’ in Sydney is ‘premium’ in other places, so this may reflect a concentration of falls in Sydney and Melbourne. Still, it’s how I’m reading the market right now. It’s a work-horse market. Solid properties will do well. Flashy properties with too many bells and whistles might struggle. Some have suggested that the Banking Royal Commission could result in a ‘credit crunch’, with an associated acceleration in housing price declines. While nothing can be ruled out, particularly if prospective homebuyers come to expect large price falls, the evidence to date suggests that the maximum impact of credit tightening was in the period 2015 to 2017, with the changes being implemented this year so far more modest in nature. We don’t see strong incentives for banks to noticeably restrict housing credit against a relatively positive macro backdrop and given that a large share of their profits — and balance sheets — rely on housing lending. …There haven’t been discernible effects on household perceptions of the state of their finances which are around average levels. Household views on whether it is a good time to buy a home have actually improved a little, albeit from low levels. …We expect the current modest rate of decline in national dwelling prices to continue for some time, but this would suggest a fall of only around 2% over the course of 2018. 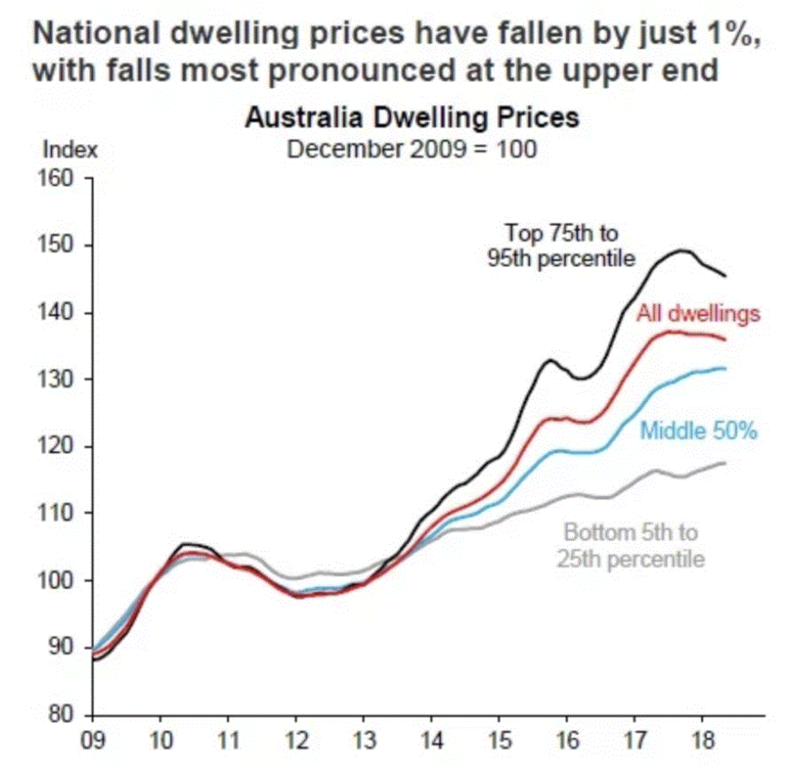 Over the next couple of years we expect national prices to have fallen 4-6% from the peak, with Sydney prices forecast to fall around 6%, to be down around 10% from the mid-2017 peak. 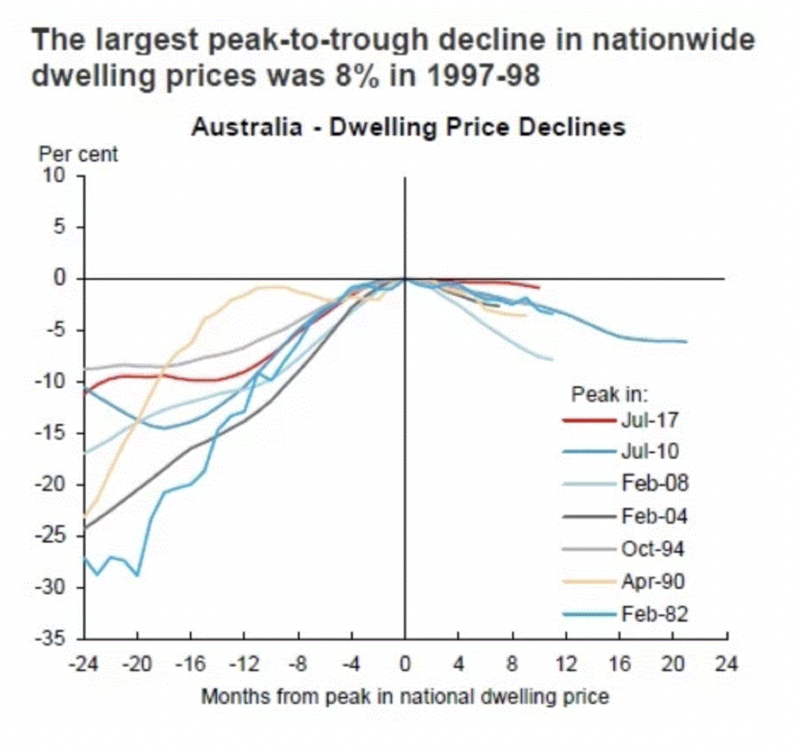 We note that Australia has had six previous episodes of declining housing prices since 1980, with the peak-to-trough range of 2.5% to 8%. Nearly all previous corrections occurred following interest rate rises, a drag unlikely to be repeated anytime soon in this cycle. While market corrections are always worrisome for some, we think the regulators would be largely delighted with the orderly cooling of housing markets so far. RBA Governor Lowe has noted that an optimal outcome would be a sustained period of broadly flat nominal housing prices. I think I’d broadly agree with all of this. Sydney probably did overshoot a little, so something of a correction was probably in order. But it’s not going to be major. And without interest rate hikes, it’s hard to see the market losing much ground over all, especially as macro conditions remain positive. And we know that APRA, and to a lesser extent, the RBA, have been worried about escalating house prices. This is the goldilocks scenario for them. Prices cool just enough for everyone to take a breath and get their heads on straight again, but not so much that we create a flurry of panic selling and crash the market. As they say, regulators must be ‘delighted’ with how things are playing out. So there’s nothing to panic about here. An expected correction, playing out as planned.